With the iPad coming in cheaper than expected, traditional ebook readers like the Kindle and Nook seem awfully pricey. Enter the Kobo. The Apple iPad costs $500, at its cheapest configuration. It has a color screen, Wi-Fi, multitouch, a massive app store, the force of the publishing industry behind it, and more cachet than it can handle. The Amazon Kindle and Barnes & Noble Nook? Both $260, both with slow, black-and-white e-ink screens and severely limited functionality. Those latter two may become very tough sells once the tablet revolution really kicks off. But there’s still definitely a market for more traditional (in this case, traditional means a whopping two and a half years old) ebook readers. E-ink is still the best possible display for reading–without a constantly-flickering backlight, it’s easy on the eyes, and its lack of illumination also means that its battery life is measure in weeks, rather than hours. $260 is way too much, and I wouldn’t be surprised to see both the Kindle and Nook take significant price cuts soon, but they’re not likely to compete with the surprisingly excellent-looking Kobo reader, at almost half the price. Kobo previously created software for Borders Bookstore, found on most mobile and desktop platforms, but now they’re coming out with their first hardware, and it looks extremely appealing. Better-looking than the Kindle, with a sleek, white plastic frame and a stylish quilted nylon back, its UI is where it really shines–it replicates the “virtual bookshelf” look used by apps like Android’s Aldiko and the iBooks store that’ll be found on the iPad. As far as tech specs go, it’s not incredibly impressive: it has only Bluetooth for wireless connectivity (no 3G or Wi-Fi, not that you need Wi-Fi in these things), the standard 6-inch e-ink display like the Kindle and Nook, and it’s got only 1GB of internal storage (expandable to 4GB, though 1GB holds about 1,000 books). But it comes with 100 free ebooks (not clear how that works–possibly public domain books? ), supports EPUB and PDF, and will support ebooks from the Borders ebook store (it’ll also be sold in Borders). So it sounds fine, if unexciting. Why does it qualify as a WANTED gadget? The answer: the price. At $150, it’s ridiculously cheap for an e-ink reader, and cheap enough to steal sales away from the iPad and its ilk, if all the buyer wants is an ebook reader. But the great thing about the Kobo is that it doesn’t look like a ridiculously cheap gadget. It looks as good as any of the market leaders in its category, for nearly half the price, not like the kind of gadget you have to apologize for by saying “well, it was really cheap.” We’ll still have to see how it handles periodicals, and whether its refresh rates are tolerable, and all that stuff. 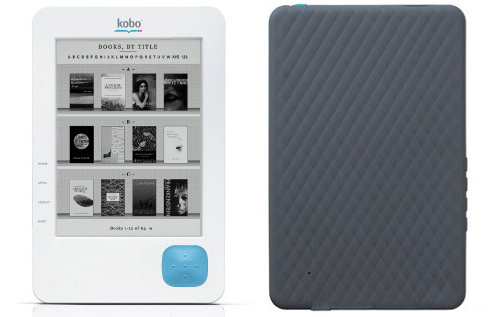 But from this first look, the Kobo could be the e-ink reader to beat. The Kobo eReader will go on sale this summer, for $150. It’ll be sold at Borders Bookstores nationwide.